An unlikely artist, Edward Gilmore channels his energy into opening a gallery in an unlikely place. Gravel crunches underneath Edward Gilmore’s work boots as he lumbers from a tan pickup truck screaming with ads for a house painting company and a veterans motorcycle club. The hulking Gilmore is covered — from the neckline of his sweatshirt to the toes of his boots — in splatters and smears of paint, like he just took a swan dive into a vat of latex semi-gloss. The gravel parking lot slowly rises to meet a train trestle in the shadow of an enormous orange brick building where North Division becomes South in downtown. Pipes exhale steam from the top of the building. At one corner is a small, unmarked green door. When Gilmore opens that insignificant door, he opens a portal to something unexpected. Hidden among train tracks and vacant buildings is Spokane’s newest fine-art gallery, Studio 66. There’s no sign, no windows to the inside. It might sound like an odd business strategy, but it’s a contradiction that has proven to work for Gilmore, a 45-year-old house painter who was inspired to make art after watching the film Pollock. Since 2003, he has painted more than 600 “abstract expressionist” works, and says he’s sold them to collectors around the globe. He’s become a full-time artist. And now, he’s ready for another experiment: to open the best damn art gallery in Spokane. Gilmore has been making art for less than a decade, but he’s already peaked, plateaued, burned out and, slowly, risen again. “I started too fast, too quick, got too lucky and I burnt out too quick,” he says. Gilmore grew up around paint. His father and grandfather were painters. But never did he think to actually make a painting with paint. Paint was what he used to make money, and painting — houses, mostly — was a family trade. So he ducked out of the limelight, regrouped and started turning an old storage space into the 3,000-square-foot gallery space that he’ll open to the public this week. In his new gallery on Division, his works — which he often refers to as “original Gilmores” — hang throughout the space, interspersed with the works of other artists. 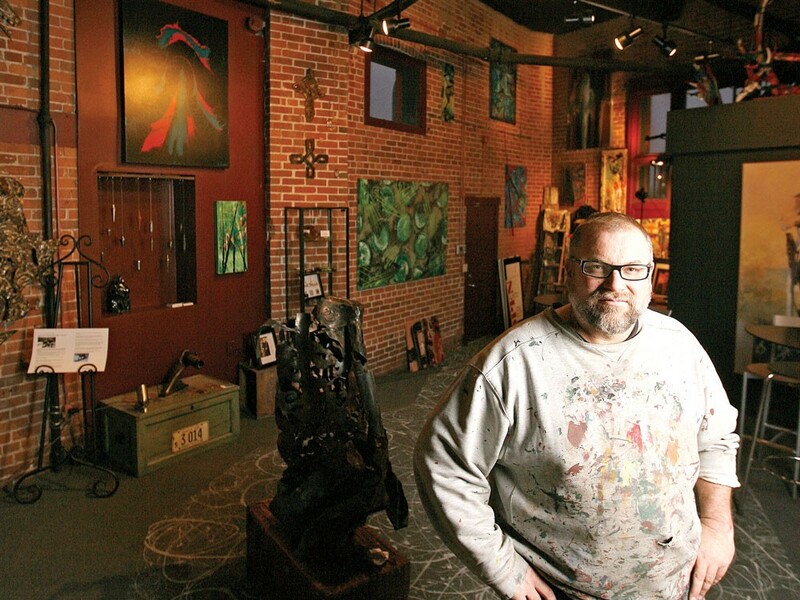 But he says that his Studio 66 — named partially for the year of his birth and partially because he views Division as the “Route 66 of Spokane” — is less of a place to see art and more of a place for artists to relax with other like-minded creatives. Tucked just behind the door from so much grit and grime, the brick-walled space is a dramatic change — inside and out — from the more refined white walls of Kolva-Sullivan Gallery on the west end of downtown, or the pristine space of the defunct Lorinda Knight Gallery downtown. One room at Studio 66 reflects the clashing grit and grace of Gilmore’s career: The walls are covered with high art and, yet, still, a fluorescent bulb buzzes above and the constant clunk of trains outside shakes the gallery floor. As Gilmore talks about the frantic pace of his career, an older gentleman opens the unmarked door. Gilmore greets him with a “howdy” and, after a few minutes, asks the man what he needs.